The user first parks the vehicle in a designated drop-off area before sending it to be parked using the smartphone app. The vehicle’s onboard technology safely maneuvres the car in response to commands from the intelligent car park infrastructure. The user can pick up the car through the smartphone app, after which it rolls to the pick-up area without a driver. Through Automated Valet Parking, the user can retrieve the vehicle via his/her smartphone app. Daimler and Bosch have announced the successful premiere of their joint Automated Valet Parking pilot in Beijing. The technology, which debuted in the parking garage at the Mercedes-Benz Museum in Stuttgart in 2017, symbolises a pioneering effort in infrastructure-supported driverless parking and marks the first pilot of its kind in China. Automated Valet Parking, to the extent legally allowed where used, enables vehicles to proceed to an assigned space and for the user to retrieve the vehicle via their smartphone. This will undergo further testing by Daimler and Bosch at the Mercedes-Benz Research and Development Center. 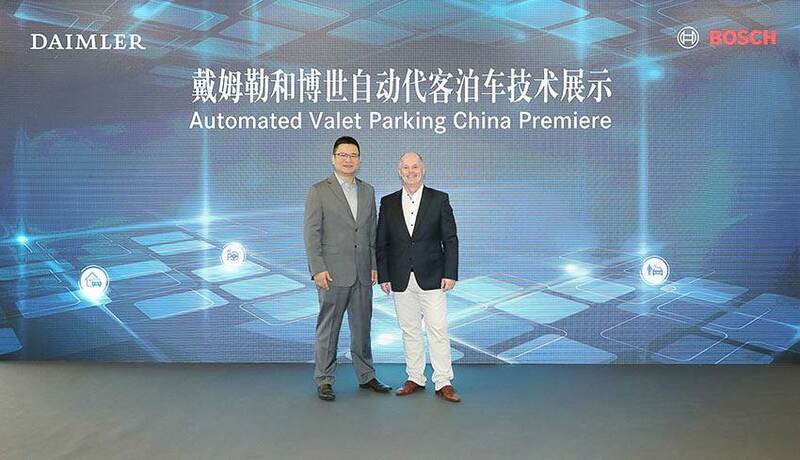 L-R: Ming Chen, President of Bosch Connected Mobility Solutions China and Prof. Dr. Hans Georg Engel, Head of Mercedes-Benz R&D China, at the premiere of the joint Automated Valet Parking pilot in Beijing on September 14.